Dust Capacity 3.5 dry qts. We purchased this vacuum when our 5 year old SC684F broke. We ordered parts to repair the old one and this new one and our housekeeper loves it! He calls it the MONSTER! The on board tools and bag less feature are great. We use it to maintain our 127 room senior apartment building and are very happy. Thank you for good service and good products. This machine has performed above our expectations. It has been great at getting up dog hair and other dirt left by our previous cleaner (a 20 year old Sanitaire. We also love the bagless feature and the long cord. We use this for commericial cleaning, we have purchased several cleaners and have been pleased with all of them! The best feature is the bagless (dirt cup). I knew my old vacuum was missing some stuff, but it really surprised me at how much this vacuum picked up. My carpet actually looks cleaner! Best compliment I can give is that I will be a return customer. Exactly the kind of customer service you would want. No hassle ordering, fast shipping! Q: can you turn the beater brushes off? Do the beater brushes stay on when the vacuum is on and in the upright position (not being pushed) ? Q: WHAT IS THE WARRANTY ON THE SC5845B? 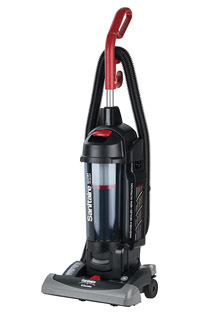 Q: Can the cord length on this item, and all Sanitaire Vacs be increased? A: Yes, but be sure that the gauge of the cord is bigger than what comes with the unit. 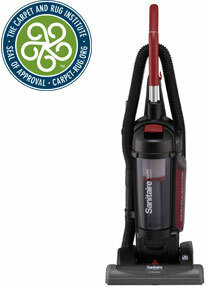 Q: We have the Sanitaire SC5845B and are having trouble with the hose input. When we use the hose dirt comes out when the hose would normally attach onto. Not sure what the problem is. Why would dirt be blowing out when using the hose? A: This could be from a clog in the hose or a filter causing a back blast. Q: Does this work well on wood floors. Can the height be adjusted? Looking to use this in my house. A: Height can be adjusted, but the brush roller will keep turning and forcing the dirt away from the vacuum. I wouldn't recommend this unit for bare floors. Q: How does this vacuum perform on high/plush pile? A: With the variable height adjustment, it will work fine. I this is the newer super plush carpets, then no.